teenagers wishing to build and experiment their own first cooker. If you belong to one of these categories, here is how you can build a cheap and fairly efficient small cooker. Choose a cardboard box (figure 1) with the height BC greater than the width DC. For example, in my own cooker BC = 30 cm (about 12"), DC = 23 cm (9") and CG = 25 cm (10"). Cut the flaps off the box. Then cut the seams along FG and GC. Do the same on the other side along EH and HD. The carton folds out to a flat assembly of five rectangles as shown in figure 2 (Letters appearing twice on this figure indicate two points which were the same point before cutting). If the cardboard is thin, reinforce the rectangle CDHG by gluing another rectangular piece of cardboard onto it to better insulate the bottom of the pot. Then glue aluminum foil to one side of the five rectangles (the inside of the original box). Now, keeping the rectangle CDHG horizontal on a table or on level ground, position the other rectangles as shown in figure 3. The front "mirror" EFGH is tilted about 30 degrees above the horizontal plane (Put a rock or other object under it). The "wing mirrors" BFGC and AEHD are vertical, the angles GCG and HDH being about 45 degrees. A few rocks as shown in figure 4 will be helpful, especially in windy weather. The black cooking pot is put on the horizontal base CDHG and covered with a colorless glass salad-bowl [or oven cooking bag, see next article, ed.] replacing the glass window of a classical box cooker. To avoid convective heat losses, the diameter of the salad-bowl should not exceed the width CD. A more convenient way of keeping the reflective system in good shape is to mount the panels on a wooden board in which you will drive a few nails on each side of GC and HD to maintain the wing mirrors in their correct position (see figure 5). Although this cooker uses (slightly) concentrated sunlight, it is not necessary to worry about a constant tracking of the sun. A big vertical nail at the front of the board can act as an "orientation indicator". Its shadow should be seen on the white triangular piece of paper glued on the board (figure ) and whose 30 degree angle roughly corresponded to 2 hours of absentee cooking in my experiments. Most of the following results have been obtained without any readjustment of the cooker orientation. All cooking was done in an aluminum pot painted black. Scrounged glass jars may be used, even without the salad-bowl, but cooking times are increased. The latitude of Paris is about 45 degrees. When cooking at lower latitudes the vertical reflectors become less effective; it remains to be tested whether this design will work as well there. On the other hand, people living at latitudes above 40 degrees could find it more efficient than a simple, one-reflector box cooker. I'm interested in knowing the results obtained by readers who live in other parts of the world. La Association Lyonnaise pour l'Etude et le Developpement de l'Energie Solaire. A.L.E.D.E.S. I am really excited by the opportunities opened up by Roger Bernard's panel cooker design. We have known that multiple reflectors can be used to concentrate solar radiation, but until I watched my lentil stew bubbling under the glass salad bowl, I did not see this as a serious cooker. Suddenly, I realized that an oven cooking bag could be used in place of the salad bowl. This would provide a very abbreviated solar "box." All we have learned over the years with box-type cookers could be helpful in utilizing Solar Panel Cookers (SPCs). Now we may have both our "oven" and our "hot plate." By limiting ourselves to flat foil-covered panels, the danger of eye damage is greatly reduced but remains a problem. Retinal damage, which can occur when sunlight shines into the eyes, is not painful. You cannot tell it is happening, but a retinal burn produces permanent damage and can result in blindness. Be extremely careful if using anything that concentrates the light or reflects the sunlight directly into your eyes. The first cooker I made based on Roger Bernard's specifications would not fold neatly. The illustrations show a slight modification of Roger's design. Since the panels are all the same size, they fold to form a flat packet which is so small and light-weight that it can be used by backpackers and others who do not have space for much storage. The extra cuts and folds also provide areas where rocks can be placed to anchor the panels without blocking any sunshine. Our winds are fierce and unpredictable! I have found that a cardboard SPC in this configuration tolerates the wind very well. Place the cooking pot in an oven cooking bag with the opening at the top so you can open the bag, check the food and seal it again without disturbing the cooking. And that part of the bag is usually dry. This is important because food in a panel cooker usually does need to be stirred and checked, since the heat is not as even. First I closed the baking bags with clothes pins--too heavy and bulky. Then with paper clips tore up the baking bag which otherwise was good for many uses. Then with a thin piece of wire worked well but the twisted wire broke after several uses. Now I am using wire but simply wrapping it tightly around the baking bag top, without twisting. Since there is no pressure, it works fine and the twist ties last a long time. Too often I have found jars or pots have vigorously boiled over, spilling juice and making a mess. Got to remember to allow more space at the top to contain a boil, at least until I get a handle on when this is going to happen. A delightful problem. Food does not have the delicately enhanced flavor of SBC cooked food, probably because of the higher temperatures. Then I noticed a cold spot on the foiled reflector directly under a pot and remembered the advantage the University of Washington engineers found through elevating the SBC tray off the cardboard bottom. I looked around the kitchen for an "elevator" and seized on canning rings. It is clear that pots heat faster when sitting on a canning ring than when sitting on the foiled cardboard. Darkened canning rings work better than shiny, of course. But the center is dark and I wondered if it would help to get light to shine under the pot. I put three little pebbles, dark and oiled, under a pot. That seems to work even better. I like that . . . three little pebbles used in memory of the historic three stone fire that has served humanity for thousands of years. Women, nostalgic for the wood fire where there is no more wood, might even take tiny pieces of wood and form a little "fire" within the pebbles under the pot. It would keep us from feeling so torn away from roots. 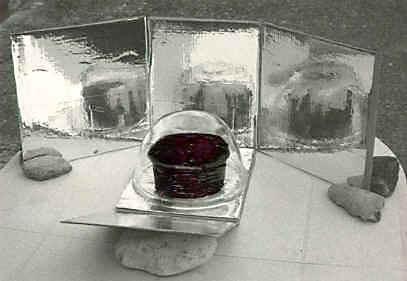 Solar cooking continues to get simpler. I have put major attention on simple solar cooker designs for 20 years, working to have them easier and more accessible to everyone. Today, I held a Solar Panel Cooker and realized our 20 year mountain of work had truly brought forth a mouse. A mighty mouse! Simplicity is so difficult...difficult to see, not difficult to do, once the idea forms. I think that box-style cookers will remain part of the solar kitchen where time, material and circumstances dictate, but the SPC has opened up a new level of simplicity. We are doing pretty well with reducing the materials needed to solar cook. If only we could eliminate the need for oven cooking bags of heat-resistant nylon. I used regular kitchen plastic bags and they seemed to hold up under the heat for several cooking times. But January 12 was brighter, the air was warmer, and three different kinds of regular plastic bags melted. I guess we will have to stick with baking bags . . . too bad. But the baking bags I started with two months ago are still in good shape, having cooked many dishes and been washed and dried many times. Perhaps they can be obtained wholesale and distributed one or two at a time where they are not available in stores. We should be able to get them wholesale if someone puts a little effort into it. It seems that "open-box" cookers will now be an integral part of serious solar cooking. It will just take finding out specifically how to use them. Please send your findings and comments to me as well as to Roger Bernard. We'll keep everyone else up-to-date through Solar Box Journal.